SCOTTSDALE – Tuffy Gosewisch is a familiar name for Arizona baseball fans. Following an All-State career at Horizon High School, the catcher played for Arizona State and now, almost 10 years after he was drafted, Gosewisch is positioned to get his first career starting spot for the hometown Arizona Diamondbacks. Gosewisch was drafted in 2005 and bounced his way through minor league teams until he received his first big league call-up with the D-Backs in 2013. Last season, he saw 132 plate appearances in 41 games as a backup catcher. After the departure of long-time starting catcher Miguel Montero in the offseason, the spot seems to be Gosewisch’s to lose heading into the spring. Newly-hired D-Backs manager Chip Hale holds Gosewisch in high regard. The long-time minor league catcher maintains that trust with a cool and collected demeanor. This is the first time in nearly a decade a new face will get the starting nod at catcher. However, Arizona pitchers aren’t concerned about the transition. Starting pitcher Trevor Cahill, entering his fourth year with the D-Backs, welcomes the change. Ziegler is also confident the catcher’s age and experience will translate to big league success. Gosewisch’s time with the team last season was a big part of earning the trust of the pitching staff. The spring goes beyond the position battle for the veteran catcher, though. It’s also another homecoming. He’ll play in front of friends and family from his hometown of Scottsdale and the local ASU fan base. 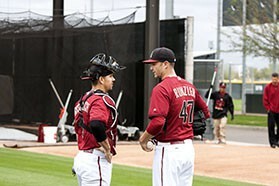 Diamondbacks catcher Tuffy Gosewisch and non-roster invitee pitcher Dan Runzler talk during spring training warm ups.